The Champion Sports Home and Road Pitch Counter allows coaches to simultaneously track both the home and away team pitches with dual four digit displays and easy reset buttons. The counter is ergonomically designed to fit comfortably in the hand. 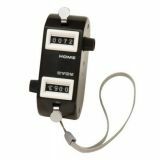 Count laps, lines, or pitches with our high quality Champion Sports Tally Counter. 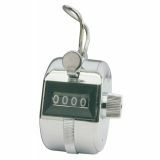 This metal thumb operated counter features a four digit display and an instant reset button, along with a convenient finger grip.